Edgar Degas (1834-1917) was a French painter, sculptor, printmaker, and draughtsman, best known now for his many paintings of ballet dancers and his most famous sculpture, The Little Dancer of Fourteen Years. Although he is considered a founder of Impressionism, Degas disliked the term and his ties to the group are a bit more tenuous than amongst the other core members. This piece is an outlier in Degas's career; he did not paint many nature scenes, preferring to depict Paris society. The outdoor paintings he did produce were usually either of sport or history paintings. Instead here we have a beautiful early work in the dappled light of a forest. For a scene of complete stillness this painting has quite a bit of energy. The forest seems entirely alive, making the fox's demise completely incongruous to its surroundings. 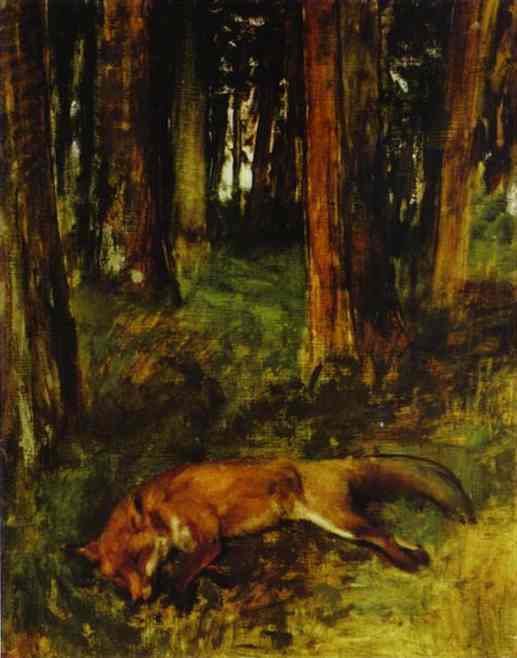 I think Degas communicates quite a bit of sympathy for this dead animal, who lies unmoving, but with its russet fur still gleaming in the sunlight. These effects are mostly achieved through the brushwork. Degas is known for his loose paint handling and he used the technique to great effect to depict the movement of dancers. But in this case he manages to communicate that lack of movement instead and bring us into this forest and the presence of this fox.